If you are lucky you live near a Red Robin, home of the bottomless french fries! If not, you may need to take a journey to this amazing burger place. Red Robin makes lots of creative and fun food. This place is fun and festive and it has something for the whole family. Who started making fried pickles first? 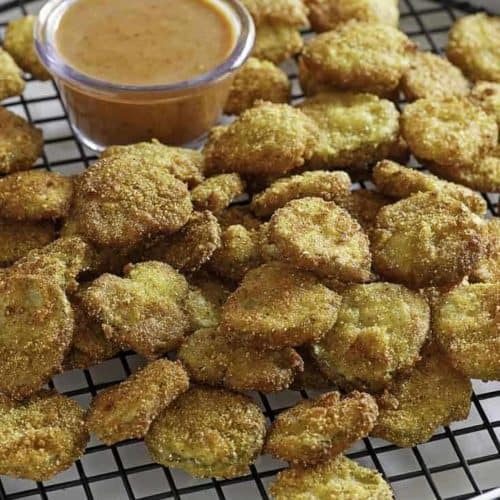 It is believed that fried pickles originated in the South. In the South fried foods were very common because fried foods cook quickly, and there is no need to heat up ovens, or spending a lot of time at a hot stove cooking. Until the widespread use of air conditioning, many people in the South looked for quick cooking methods like deep frying to quickly cook their food. 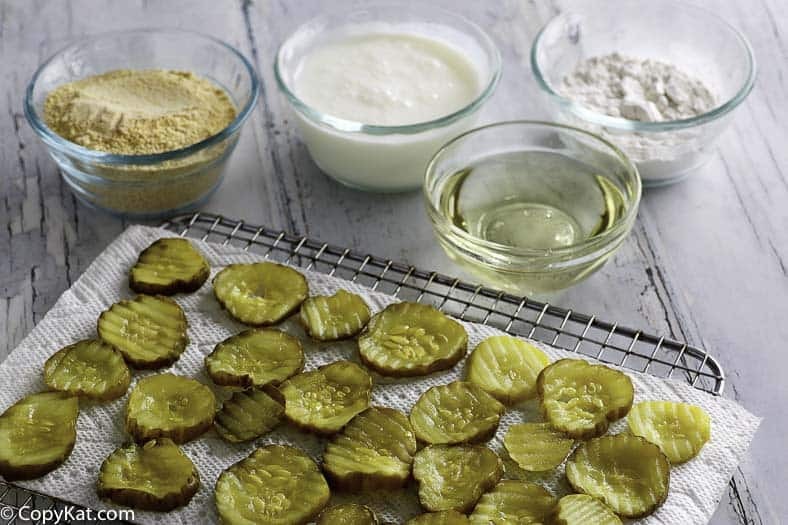 The first recorded recipe for fried pickles was in 1960, and it was for sweet pickles fried in pancake batter. This recipe was found in the Oakland Tribune. 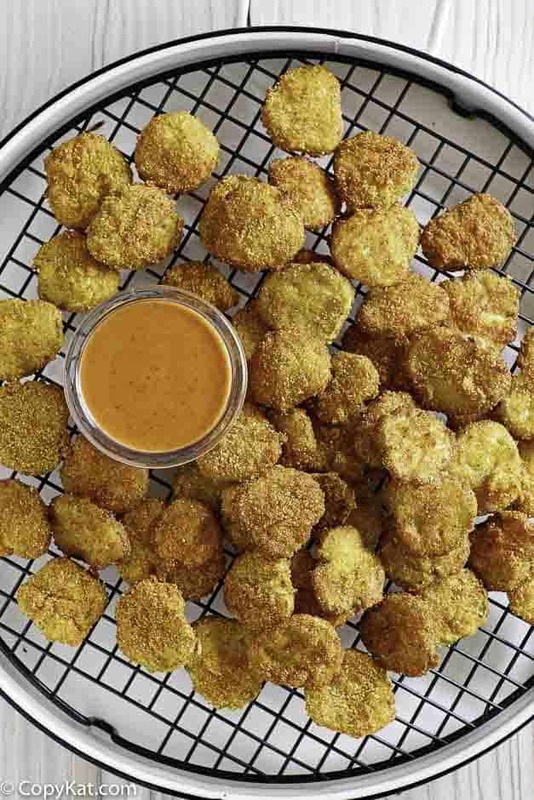 A few years later, fried pickles showed up in Atkins, Arkansas at the Duchess Drive-Inn. Ever since then, the recipe has continued to evolve and now fried pickles are served at many different restaurants. What Makes the Fried Pickles at Red Robin so special? Many places use just seasoned flour or cracker meal for their recipe. 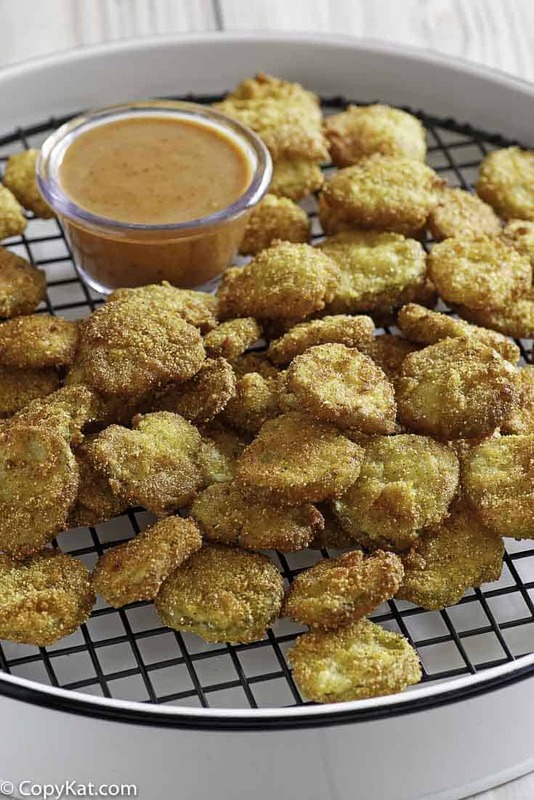 If you have never tried these fried pickles before, you will notice that they use cornmeal as part of the breading. The cornmeal really changes the texture and keeps fried pickles from becoming soggy like some can. Love Red Robin Pickle Nickels? Make your own copycat Red Robin Pickle Nickels at home with this copycat recipe. Set up a breading station. To the first container, add the flour, salt, and pepper. Stir to combine all ingredients together. In the second container, add the buttermilk. In the third container add the fish fry mix. Preheat oil to 350 degrees. You will need to add enough oil to cover the bottom of the pot or cooking vessel to a depth of 3 inches. First bread the drained pickle chips with flour, then, shake off excess flour and lay on a wire rack. Then dip the pickles in buttermilk, and finally dip them into the fish fry mix. After they have been coated with the fish fry mix, shake off the excess fish fry mix, place them on a wire rack for 2 minutes before cooking. This will help keep the coating on the pickle. Cook for about 1 to 1 ½ minutes in the hot oil. Remove when they start to turn a darker color. Drain on a wire rack. Hey, that is awesome. I wished we knew the name of the steakhouse. I have no doubt these were made sooner, documenting it can be difficult. I will do further research. We gobbled these right up! This recipe may work in an air fryer since these are breaded. I find anything that is battered works poorly, but breaded works very well. I would make this recipe as prepared and then cook at 390 degrees for 5 to 7 minutes. I would use another brand of seasoned cornmeal based fish fry. Look for Zatarain’s brand. They are nationwide. If you find this brand choose the version that say’s “Wonderful” on the front of the box. This “Wonderful” version is more Creole than Cajun in taste. I will have to check that out! Thank you for the suggestion. I love these. So tasty.